Citation: C N Trueman "Accession Crisis of 1553"
In 1553 it was clear that Edward VI’s health was failing quickly. This presented Parliament and the Privy Council with a major problem. 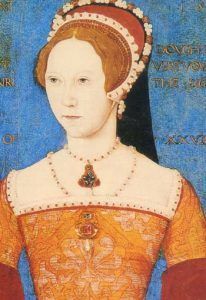 Henry VIII’s will had clearly stated that if Edward died childless, his first daughter, Mary Tudor, should succeed to the throne. However, Mary’s strong Catholic sympathies were at odds with the way the Church of England had been reformed since 1547. Whether the Church was now in 1553 primarily influenced by Luther or Calvin was for theologians to argue over – but it was a Protestant church. John Dudley, Duke of Northumberland, as leader of the Privy Council, also knew that his power would go once Mary was crowned as she would have seen Dudley as the driving force behind the religious reforms. Few doubt that the king was also not in favour of Mary succeeding him. He, as with his advisors, was well aware of Mary’s staunch support of Catholicism and her desire to re-establish Papal authority over England. Edward was, therefore, easy to persuade that another route was open to him. Northumberland planned to convince the king that Parliament could disinherit Mary and Elizabeth in favour of the Suffolk family. Frances, Duchess of Suffolk, was not considered as it was generally accepted that she was too old to have an heir. Her eldest daughter, Lady Jane Grey, was chosen to succeed Edward. In May 1553, Guildford Dudley, eldest son of the Duke of Northumberland, married Lady Jane in a move that would have cemented Dudley’s position in power. The change to the succession was given some form of legality by a ‘Letters Patent’ signed by Edward VI on June 21st 1553. Lady Jane was proclaimed Queen on the death of Edward but Mary proclaimed herself Queen while she resided at Framlingham Castle in Suffolk. Dudley made two major mistakes. First, he completely failed to appreciate the support among the people for Mary to be the legitimate ruler. Second, before announcing Lady Jane as Queen, Dudley had failed to secure Mary, leaving her free in Suffolk to rally support. Far too late, Dudley marched with 2,000 soldiers to Suffolk to arrest Mary. However, many of the soldiers deserted along the way. Aware of their very weak position, the Privy Council announced Mary as Queen – having previously given their support to Lady Jane. Dudley was arrested in Cambridge, tried and executed on August 22nd. The ease with which Mary upheld her right to the throne showed how the nation supported the rule of law and dynastic succession. The popularity Mary had at the start of her reign was shown in the enthusiastic manner in which Londoners greeted her during her coronation procession in September. Laws were passed that confirmed Mary’s legitimacy (1553) and Elizabeth’s right to the throne should Mary die childless (1554). By doing this, Parliament removed any threat there may have been for challenges to the throne and for the country to descend into a civil war.